This is the luxury issue, so for it we thought it would be fun to feature some millionaire shortbreads. These are a caricature of quintessential English afternoon treat, alongside a large pot of tea, and perhaps some jam scones, on a floral table cloth, the rain lashing against the windows of a dated café in any English town, north or south, tea with an ageing aunt perhaps, maybe even at the Ritz or Claridges here in London. The English love tea in this way. Although the Millionaire shortbread seemed to originate in Australia it has been on the English afternoon tea menu for us to justify it being classically British – is that allowed? Perhaps not as much as tea and scones but it can sit with fruit cake, cucumber sandwiches and crumpets. Millionaire shortbread or caramel shortbread as it is also known gets its name from the rich variety of ingredients – the buttery shortbread base followed by an indulgent layer of gooey caramel then the finishing with the crisp dark chocolate. Heaven on earth. The best millionaire shortbread we have ever had is from Paul A. Young in Soho – makes you go week at the knees. If you haven’t been to Paul Young it is worth a visit an amazing array of exciting flavours, things like hot cross bun truffle, Yorkshire tea and biscuit or even marmite, our favourite is the simple salted caramel. We have both tried hundreds of salted caramels in our lives and Paul A. Young’s is our favourite. Millionaire shortbread was one of the first sweet treats we made as a child, making the biscuit followed by a cheats version of condensed milk then Cadburys milk chocolate slathered over the top – makes your teeth hurt at the thought of the huge amounts of sugar. Then as we got older we would take more care and make a runny salted caramel centre adding different flavours occasionally like cayenne pepper or sesame. Great fun but hugely time consuming, and not great for ones waistline. So we wondered about making a quicker version and perhaps a slightly healthier version. We got into the kitchen and had a go, and it works! Would you believe it – here is our nutty raw caramel slice that is fully vegan – dairy free and gluten free! Sounds like the fun has been zapped out of it, but it is truly indulgent. 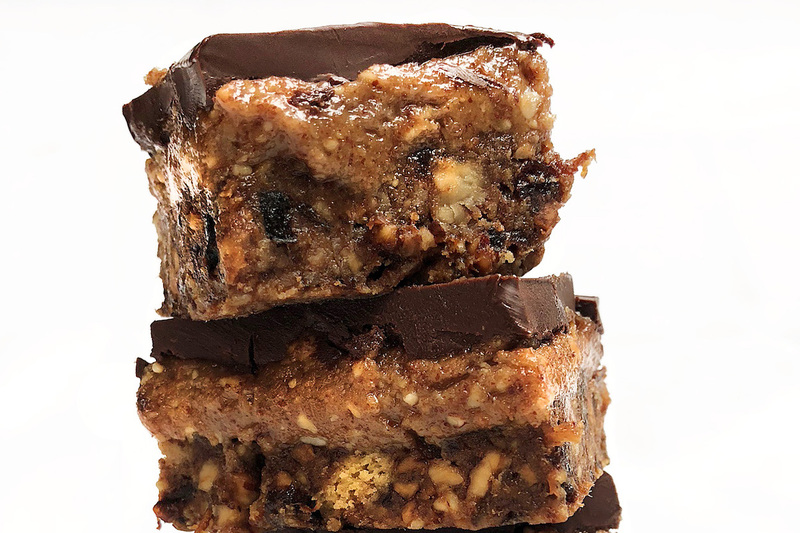 The base is sticky with crunch from the biscuits and the roasted pecans, the caramel is made out of nut butter and maple and the chocolate layer is simply dark chocolate – you use good quality dark chocolate like Green and Blacks it has no added refined sugar or dairy. The roasted nuts give it a good depth and the salt cuts through the richness. We made a batch of these on a recent advertising job, many of the crew were vegan so it went down a treat and we got many requests for the recipe. 1. Bash the pecans and the biscuits till quite fine (either in a food processor, or put in a bag and hit with rolling pin). 2. Heat the prunes in a small pan with a glass of water and the coconut oil till simmering then place in the food processor and pulse. Add the prune mixture to the pecan and digestives and mix with your hands till combined. 3. Line a 20cm x 20cm tin with cling film and press the mixture into the tin evenly, place in the freezer for 30 minutes. 4. Mix together the almond butter, peanut butter, maple syrup and salt then take the tray out of the freezer and poor in the mixture. 5. Lastly melt the chocolate and the coconut oil carefully in a small pan then poor into the tin, spread evenly and sprinkle with salt. Place back in the freezer for 30 minutes. Cut into squares and serve. Keep in the fridge covered for a week.